The wedding pictures of Priyanka Chopra and Nick Jonas from their Christian ceremony tells us a fairy tale story. 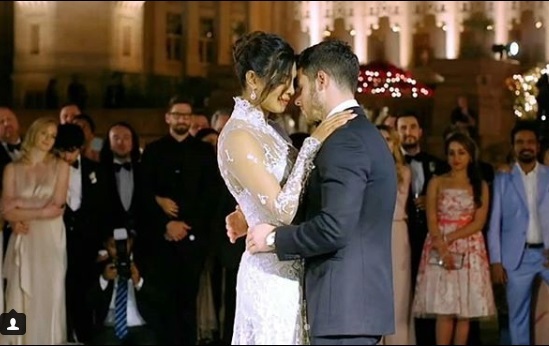 If you are cooking – turn the gas off, if at office – take a loo break and if you are still in bed – lay for some more time, because you (like literally) will get lost in time and forget everything after you will see all the inside wedding pictures and videos of Priyanka and Nick’ Christian ceremony. 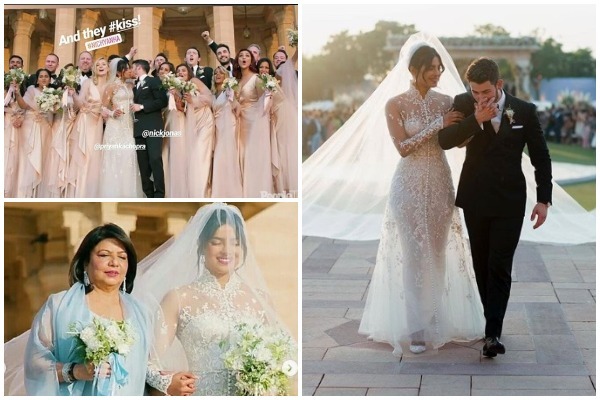 As Priyanka and Nick have exclusively given an inside story of their five days lavish wedding to People magazine, there are pictures and videos making rounds on internet which are worth the watch till you pick the magazine. As Priyanka shattered all the stereotypes be it age difference or religious difference, the Chopra and Jonas family melded together to respect and value each others tradition. 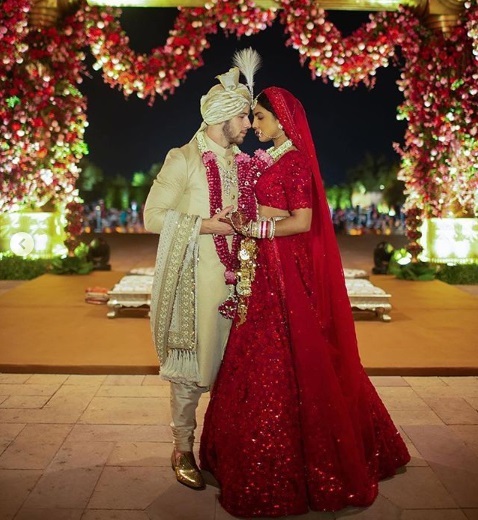 The beautiful wedding of Priyanka and Nick at the Taj Umaid Bhawan in Rajasthan brought two different cultures and religions together, where Indian bride Priyanka and American groom Nick tied the knot in two different ceremonies – Christian and Hindu ceremony. Priyanka Chopra wore a mesmerizing white gown customized by Ralph Lauren for her Christian wedding with a pair of Jimmy Choo shoes. The gown is really special because till date international designer Ralph Lauren have only designed wedding gowns for his daughter, daughter-in-law and his niece, which means he never designed the wedding gowns for anyone else other than his own family members. It took 1,826- hours of craftsman job to create hand-beaded and embroidered gown with a magnificent 75-foot long tulle veil for Priyanka. You read it right, it’s 75-foot long. It reminds us of her MET Gala look, isn’t it! Whereas groom wore Ralph Lauren designed black tuxedo. 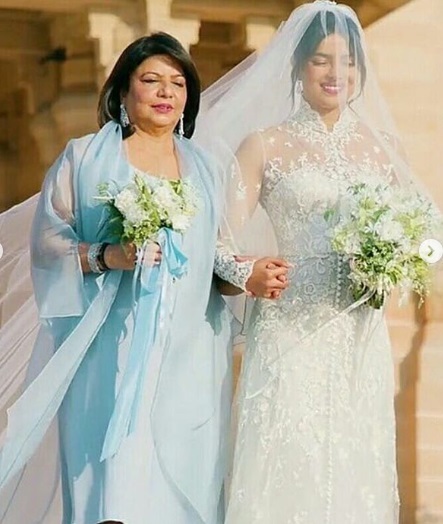 As Madhu Chopra walked her daughter Priyanka Chopra down the aisle, her 75 foot long veil is seen lifted by 5 people in back. Nick Jonas was escorted down the aisle by his mother. When he saw Priyanka walking towards him with teary eyed, he passed on a sweet gesture asking his bride to wipe her tears as she was missing her father. 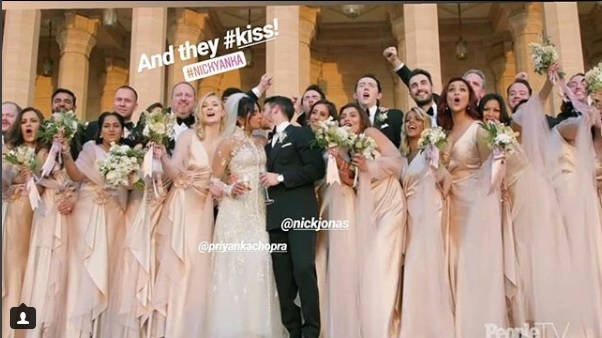 The Christian wedding of Priyanka and Nick was officiated by Paul Kevin Jonas aka Papa Jonas. The bride and groom locked their lips with all the bridesmaids and groomsmen in back. The couple also cut 6 tier wedding cake which was 18 feet tall. We can surely make an announcement after seeing the fairytale love story of Priyanka and Nick that it’s the wedding of the year or may be more years to remember. VOTE: Priyanka OR Deepika: Which Was The Most Talked and Glamorous Wedding Of The Year? If you still have those absurd comments running into your mind that Priyanka is 10-years older to his husband Nick Jonas, let us remind you that “X-Men” actor Hugh Jackman is 13 years younger to his wife, actress Deborra-lee Furness, whom he loves head over heels. If it’s ok for Shahid Kapoor to marry 12-years younger Mira Rajput and Kareena Kapoor married 10-years older and a divorced father of two kids, then we think you should take off your double standard glasses and see that Priyanka and Nick love each other. Period. Subscribe with Eventznu and Follow us on Facebook as more pictures and videos from #Nickyanka’s grand wedding will roll on.